U- 507 was a type IX-C laid down at Hamburg on Sep 1940 and commissioned on Oct 1941. The submarine large number of sinkings, 19 totaling 77 000 tons, included 6 Brazilian ships sunk on 22 Aug 42, a fact that was responsible for Brazilian declaration of war on Axis powers. His sub, a type IX-C was destroyed by one PBY 5 Catalina of VP 83 some 79 miles off the coast of state of Ceara northeastern Brazil. Harro Schacht was decorated with Knights Cross. U-507, U-156 and U-506, along with Italian submarine Cappellini, were the four submarines protagonists of the remarkable rescue of thousands of survivors of SS Laconia in September 1942 between Liberia and Ascension Island. About 1500 men were saved by these boats and French ships from Dakar. U 507 sunk 19 ships in her career including 6 Brazilian merchants.They were: Federal, Norlindo, Munger T.Ball, Joseph M.Cudahy, Alcoa Puritan, Ontario, Torny, Hammaren, Oakbank, Baron Dechmont, Yorkwood, Virginia,Amapala, Baependy, Araraquara ,Annibal Benevolo, Itagiba, Arara and the barge Jacyra. Ten were sunk in the south Atlantic. U-507 sunk having taken aboard 4 British prisoners: The captains of MV Oakbank, SS Baron Dechmont, Donald MacCallum and his First Officer and British skipper from SS Yookwood. 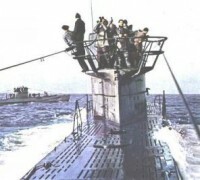 U-507 seen in Baltic for sea trials. It was on January 13, 1943, the U-507 ended its fourth patrol after 47 days at sea. The submarine operated in the northeastern Brazilian coast between the states of Rio Grande do Norte and Ceará. "We approached the bow of the submarine and still no sign he had been in sight. It seemed a long time, but in a matter of seconds we went down to 1,200 feet. The submarine was sighted in and began to sink. We reduced the dive, but the nose was still down. We increased the engine power to maintain speed. Mearl was about to push to drop the bombs on the right. Harry was on the left. I had the pickerel, the mechanism to drop the bombs in my hands. 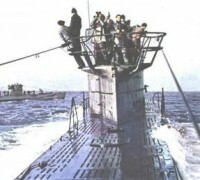 We were almost there and the submarine had just submerged, was only with the conning tower being flooded. We were less than 100 feet and still diving. I pressed the pickerel targeting shortly after conning tower. Then Mearl and Harry also released their depth charges. (...) I'm glad that all four depth charges were dropped because we were less than 25 feet and the loss of 2000 pounds helped us gain altitude. Then we were on an upward turn to the left. I looked back and what a view! They looked like the Niagara Falls upside down, a water wall was raised into the air, not in four columns, but in one. We circled the wreckage, threw two bombs of smoke but did not see anything underwater excerpt traces of depth charges. Harry Holt returned to the communication compartment marked our position and warned the base from attack. I asked on the radio "Has anyone seen the convoy?". I think it was the captain of AMM2c JW Dickson aircraft in the tower who spoke "We spent about five minutes before starting the attack. I took the controls to Mearl to head towards the convoy and turned to the crew and asked: Did you see where the depth charges fell? Yes! It seemed to have hit the submarine? Just abaft the control tower. What did you think of the attack? I thought we were going to the sub! Well, it was very close to it, but let's keep your eyes on the smoke while you can, we're going back to warn the convoy. "Lieutenant Ludwig contacted the cruiser USS Omaha (CL-4) that was escorting the convoy. The warship moved to the site of the attack but found no evidence of the destruction of the u-boot. A report was sent to the VP83 squadron intelligence office, which gave Lieutenant Ludwig and his crew credit for the attack on the submarine, although the sinking has not been confirmed. However, despite the uncertainty about the success of the mission, the submarine ceased all contact with its base and never returned to it. Its sinking was only confirmed after the end of the war. The U-507 went down taking with her four British prisoners: the commander of the MV Oakbank, the commander of the SS Baron Dechmont, known in Brazil as the "Ship of Pecém," beach name in front of which was sunk, called Donald MacCallum the Chief Mate and the commander of the SS Yorkwood. In the detail above, one PBY-5 Catalina from Squadron VP 52. It was another Catalina from VP 74 which actually sank U-507, 52 miles off the coast of State of Ceara.